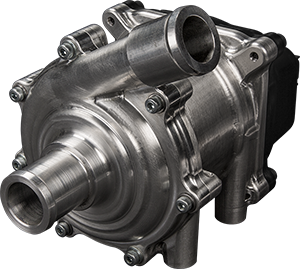 Concentric AB has recently received an order from a global truck and bus OEM, to produce electric coolant pumps for a new range of electric vehicles. This is the third nominated application for the Concentric electric pump technology, in this case relating to an electrically driven water pump that controls the temperature of the vehicle’s battery pack. Concentric's electric coolant pump offers system power savings through its variable pressure and speed control capability with the additional benefits of low noise. The modular motor and controller solution can be used in conjunction with oil, coolant and fuel pumps. A key benefit of the Concentric electric pump is the fact that it utilises a wet rotor concept. This removes the potential failure mode of a dynamic seal and is one of the key enablers to meet the demanding service life requirements. The Concentric electric coolant pump utilises a high efficiency permanent magnet electric machine matched to a pump with superior hydraulic performance. The new electric coolant pump product has an intelligent communication interface to control pressure and flow on demand. This significantly reduces system losses compared to traditional mechanical drive systems, ensuring optimum performance. Concentric’s range of electric coolant pumps have a modular design that has been developed in collaboration with a leading supplier of electric motors, resulting in a permanent magnet, brushless DC motor with integrated motor drive electronics. The elimination of brush wear contributes to the unit's ability to operate continuously and trouble-free.